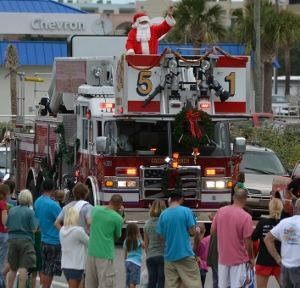 COCOA BEACH, Florida -- The 2012 Cocoa Beach Christmas Parade will take place on Saturday, December 8, 2012 at 2:00 p.m. The parade route will run south down Orlando Avenue from the Glass Bank into downtown Cocoa Beach then north up Brevard Avenue back to the Glass Bank. The roads will be closed from 1 to 4 p.m. for the event. Northbound State Road A1A (Atlantic Avenue) will be changed to a one-lane two-way road from 4th Street North to 1st Street South. Contact Pete Cunningham for more information at (321) 783-2228. There will be a "Breakfast with Santa" before the parade held at the Cocoa Beach Recreation Center located at 321 Ramp Road from 9 a.m. to 11 a.m. Children 10 & under must be accompanied by an adult. Price is $10 which includes a stocking, picture with Santa, and pancake breakfast. The following week, the Cocoa Beach Christmas Boat Parade 2012 will take place on Saturday December 15, 2012 at 6 p.m. 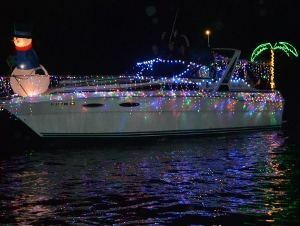 The boat parade route begins at Sunset Cafe near State Road 520 and winds its way southward through the residential canals along the Banana River in Cocoa Beach.